Each hand-cut roast comes from the large end of the whole tenderloin so they have the same meltingly tender texture and mild flavor as our center-cut filet mignon, and Chateaubriand. 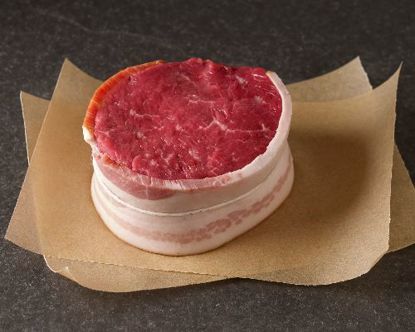 Each cut is then complemented deliciously with strips of smoky bacon that are hand-wrapped around each cut. CAUTION: A large metal pin secures the bacon to our tenderloin roasts. After cooking and before serving, remove this pin by the circular metal tab that is visible on the edge of the steak.